Cupcake wrappers are a fool proof way to fantastic looking cupcakes or muffins…now take that a step further and add dragees, edible pearls, quins, sprinkles, cake jewels and more to your wrappers to add instant character and a one-of-a-kind look to make your cupcakes shine. The possibilities are endless; and it just takes a few different jars of sprinkles and a small dab of royal icing to affix. 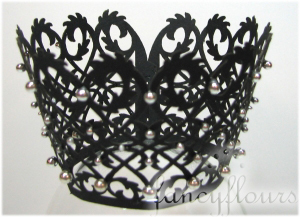 Let dry and create a whole line-up of craftily made fashionable cupcake holders all your own. 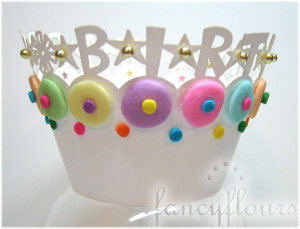 Complete line of cupcake wrappers and decorations available at fancyflours.com. This entry was posted in Baking Inspiration, Instructions & How-To's by Fancy Flours. Bookmark the permalink. I can’t WAIT for the holidays to use these wrappers! All of your autumn/halloween items are sooo fun! I love the lazer cupcake holders, but they are to expensive for my pocket book. I love these too. Will they accommodate jumbo cupcakes sizewise? What a great idea!! I love these wrappers! I love the wrappers but they are too expensive for the amount of product I would want to use them on. Love the cupcake wrappers, they add a special touch to a simple cupcake. 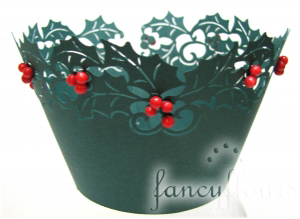 Please check out our online store: http://www.fancyflours.com for our complete selection of cupcake wrappers. Bulk pricing is available on select cupcake wrappers. Please email us for more information: info@fancyflours.com.